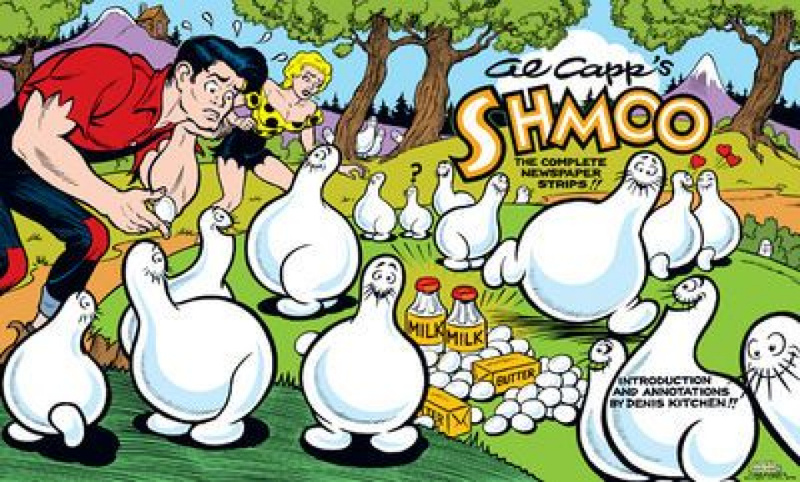 First appearing in Al Capp's Li'l Abner comic strip in August 1948, the oddly shaped (and happily edible) Shmoo creature became an overnight phenomenon, spawning an unprecedented merchandising frenzy in the late forties and fifties. As part of the Dark Horse Archives series, ALL Shmoo newspaper strip appearances and storylines are being collected for the first time ever in a deluxe, oversized hardcover! In addition to every weekly and Sunday Shmoo newspaper appearance from 1948 to 1976, this collection also features rare Al Capp photographs and Shmoo illustrations, a look at some Shmoo-centric products from its marketing heyday, a brand-new Shmoo wraparound cover by renowned illustrator Pete Poplaski, as well as an introduction and story annotations by certified Shmoo-ologist Denis Kitchen! This Shmoo archival hardcover features every Shmoo newspaper strip appearance and story line! Comics historian, publisher, and collector Denis Kitchen provides the same illuminating artistic and cultural commentary that graced Dark Horse's Al Capp's Shmoo: The Complete Comic Books, Al Capp's Li'l Abner: The Frazetta Years and the Little Annie Fanny volumes.